Poor Student | Food Geek | Good for the tummy, good for the wallet. 1. There are foods that taste great. 2. There are foods that are so pretty that they taste great even before they touch the tongue. 3. There are foods that taste great simply because you grew up with them. 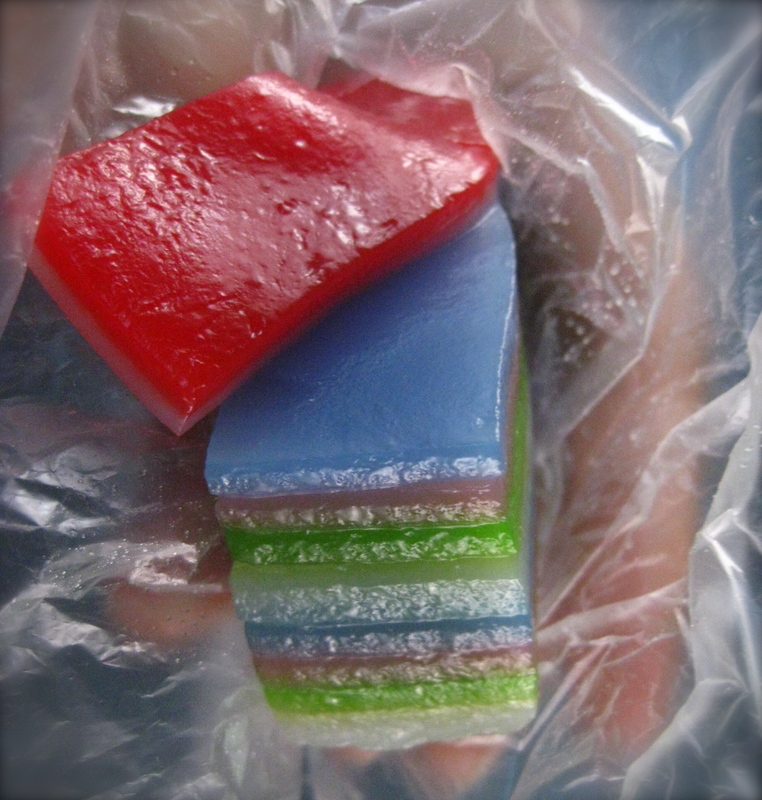 I’d peel them layer….by layer….by layer…4, 5, 6th…… 7, 8th…and with brief hesitation, I’d nibble through the 9th and final of the rainbow-coloured soft n chewy layers, mm by mm by mm… mmmmm 🙂 Happy food. Dissolve sugar in hot water to make a syrup and pour in coconut milk. Mix in starches with a hand whisk. Grease a smooth-based tin (about 10” diameter or square tin would be even better for cutting later!) and heat in the steamer. Pour in 1/3 of white layer (~110-120ml) and steam for 3-4 min on high heat. Alternate with colours and steam each layer 3-4 min until 9 layers have been created! Cool, oil surfaces, unmould and cut into pieces with greased knife. Wrap pieces with greased plastic to prevent sticking! 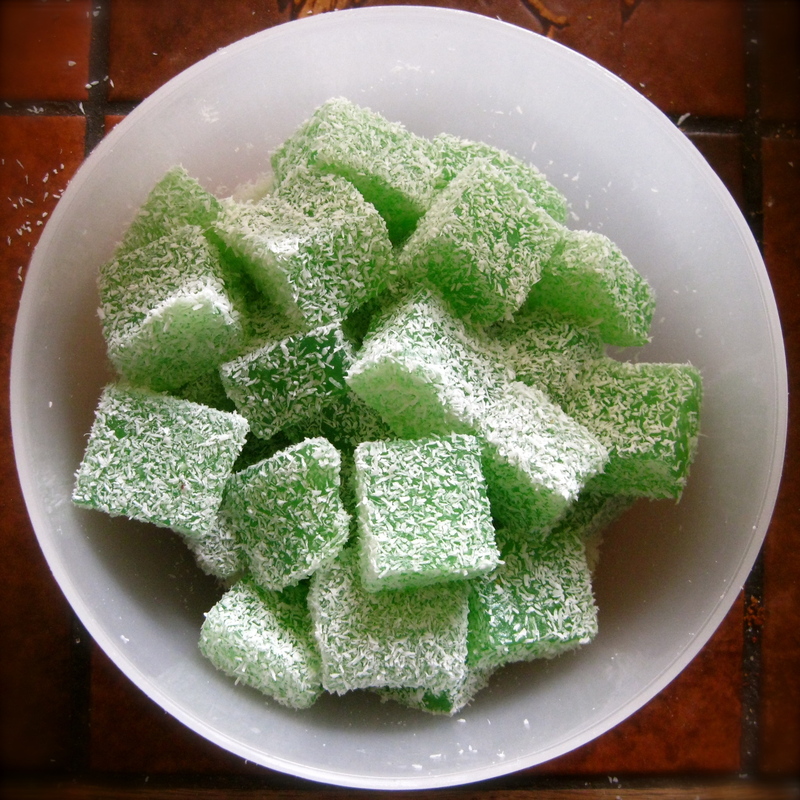 Did I mention in my last post that I’m done making green-coloured sweet snacks? Well, apparently not! 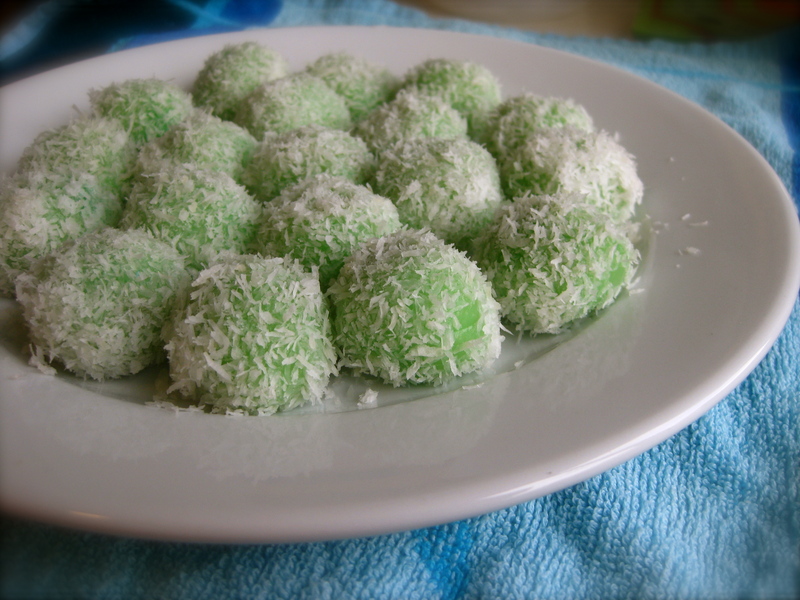 Until onde-onde (as it’s called in M’sia / S’pore vs ‘klepon’ in Indonesia) is on the blog, it definitely warrants a revisit (to make the proper instructional photos). 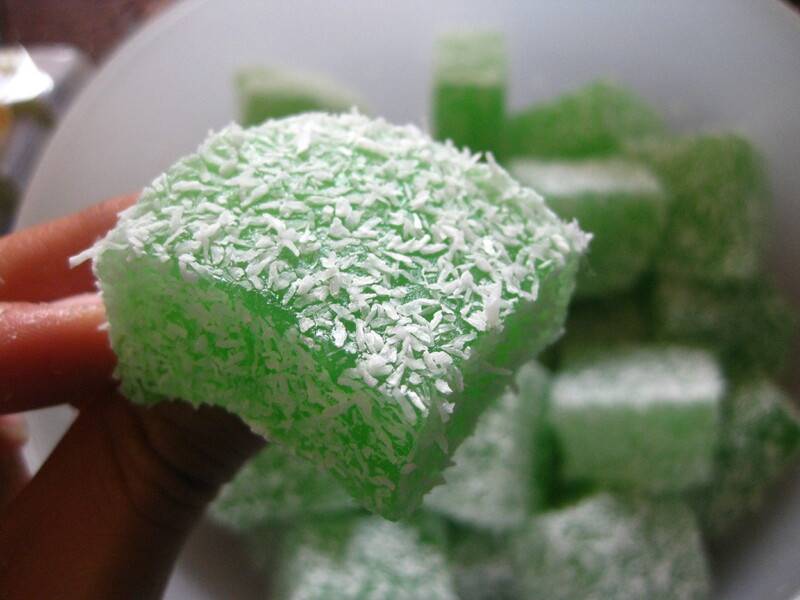 Within its soft chewy green exterior and snowy coconut-y coat, hides an unexpected sweet explosive surprise. Pop one into your mouth and BAM*! 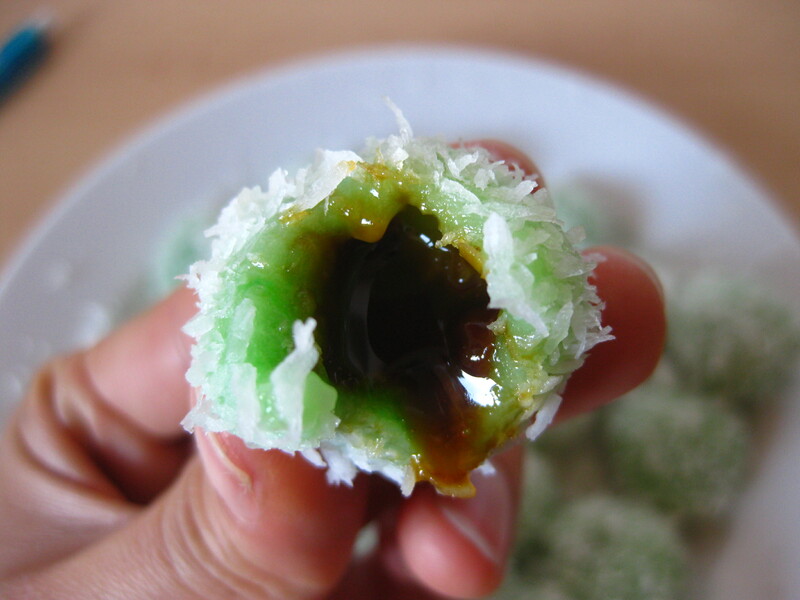 you’re hit with a burst of fragrant melted palm sugar that oozes out and engulfs your taste buds. Mmm, I really really love these green bally thingies! This post is for the cuz who settled in Perth for 2 years now and unbelievably misses none of the lip-smacking Singaporean food except for — ONDE-ONDE (seriously, how can that be, A? )… as well as for the bunches of friends who have been pestering me for it since I was obsessively making it for every other international food gathering last year~ (and even for sale at the Asian supermarket). These little squishy surprises are such simple bundles of jumpy joy! Cut sweet potato into small segments and boil / steam. Chop palm sugar into bits and mix in 1 tbsp of white / brown sugar. Set aside. Mash the cooked sweet potato and mix into glutinous rice flour. Bind together flour and sweet potato with warm water into a smooth dough. It should be easily shaped, not crumbly and not sticky. Adjust with water / flour. 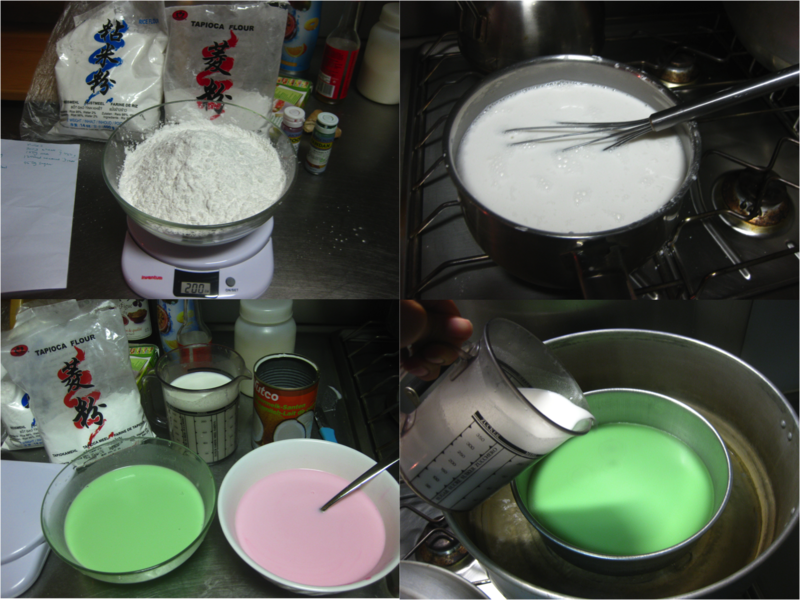 Add pandan paste to the dough and knead till colour is even. Alternatively, you could also add it in to the water at step 4. Pinch small balls of dough, flatten it with thumb, place a small amount of sugar in the middle, close and roll into a ball with the palms of your hand. Drop the balls into a pot of boiling water and give it a few stirs during cooking. When dough is cooked, it will rise to the surface (~3-5min). Meanwhile place the coconut in a deep dish and mix in a pinch of salt. Scoop the cooked dough into the coconut and swirl around to coat. Set aside to cool! Best enjoyed fresh as keeping overnight causes it to harden. Simplification: Sweet potato amount can be increased for a softer texture, or eliminated altogether for a more chewy ball. I’ve been refraining as much as possible from buying new ingredients at the Asian supermarket, because they all come in packs of 500g – 1kg and I’m just about to move across town. Don’t want to be carting additional boxes of ingredients when I already have a massive amount of stuff to worry about. And so I decided to convert the remains of my packet of tapioca pearls into one of my favourite nyonya kueh for a recent international gathering. Steamed sago cake a.k.a. 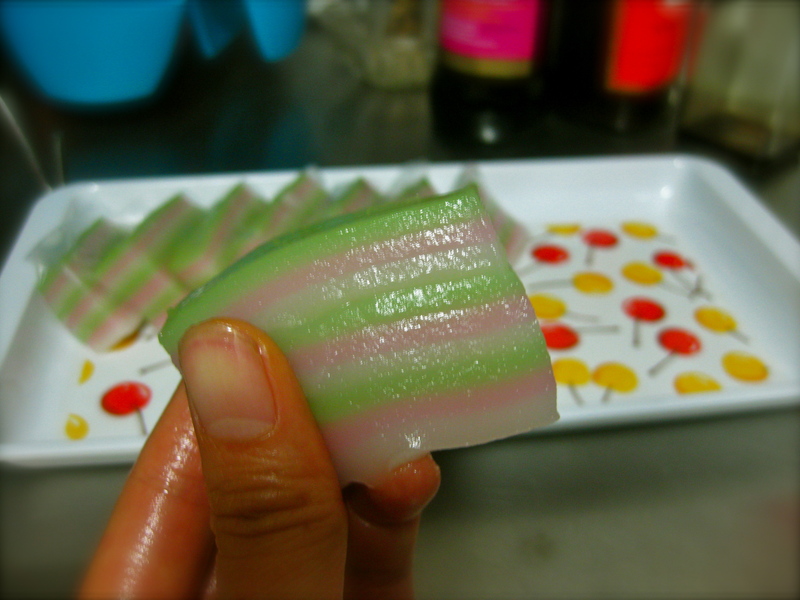 kueh sagu! But naturally, if I ever attempt to make anything, it’s of course ‘one of my favourites’, why else do I go through the effort then? Just what is sago? And what are tapioca pearls and why do I seem to use it so interchangeably? NO, they are not FROG EGGS (in reference to their appearance) contrary to some Western belief that resulted from too much mischievous Asian teasing. Both are actually starches of very similar characteristics (transparent and chewy), and are produced in the form of granules or ‘pearls’ to be used conveniently for cooking. The former is obtained from the pith of the sago palm stem, while the latter is obtained from the cassava root. Nothing weird about it at all. Just starch, like potato starch, corn starch, wheat starch… made into a more convenient and potentially innovative form. Soak the pearls in a generous amount of water (1L maybe?) and leave aside for 1h. Will double to triple in volume. 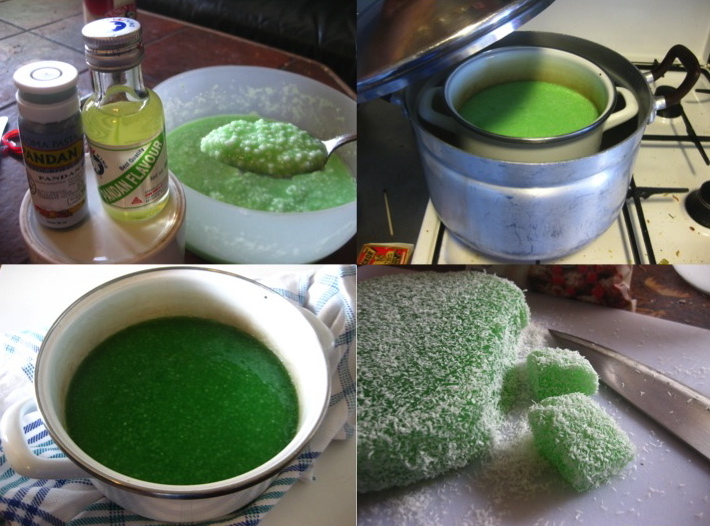 Drain away excess water then mix in sugar and pandan paste / essence. Transfer to a greased pot / bowl that fits in your steamer. Here’s how to do it if you don’t have a steamer. Steam on high heat for 20min. Cool and coat with dessicated coconut while cutting into bite-sized pieces. 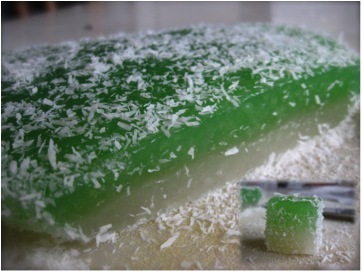 Variations on the recipe: create layers by splitting into 2 batches after flavouring with sugar and pandan essence. 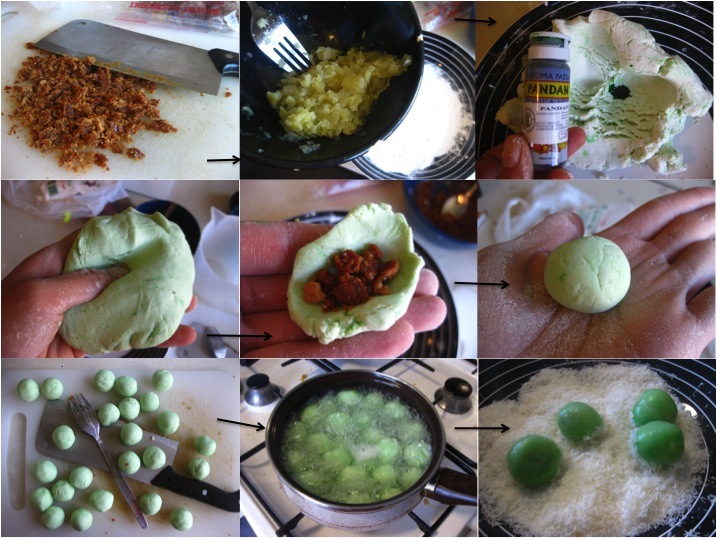 Add an additional few drops of pandan paste to colour one batch green. 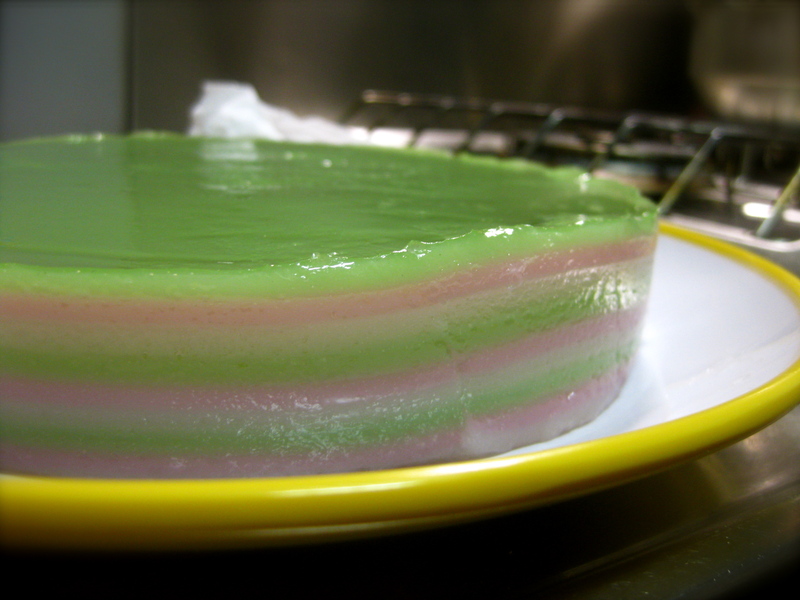 Steam the white layer for 10 min, then pour the green batch over and steam for another 20min. Other variations: colour with other colours and make layers the same way, or use coconut palm sugar (gula melaka) in place of white sugar!